Just when I thought I wouldn’t be seeing any more stellar comebacks by the end of the year, I indulge in a comeback from prolific Swedish Progressive Rock/Metal band, NIGHTINGALE, fronted by the charismatic and ever-talented Dan Swanö, well known for fronting EDGE OF SANITY. 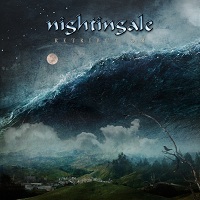 NIGHTINGALE’s music, as he has previously stated, is true to his roots and his affinity for melodic, Progressive music. And it shows; fans have come to know NIGHTINGALE as a band that grew from Gothic Rock into something much more melodic and avant-garde, come “White Darkness”; the band’s last effort in 2007, and arguably their best. That is, until the coming of the year 2014, which sees the release of “Retribution”. The new album is bigger, bolder, better, and most obviously heavier than the previous album, but still retaining the lovingly sentimental input of infectious Euro-melody. Take the band’s last couple of albums, infuse it with Swedish Melodic Rock, and the progressive affinities of bands such as SEVENTH WONDER, CIRCUS MAXIMUS and FATES WARNING. In fact, the latter is perhaps most obvious in the opening track, “On Stolen Wings”. Interweaving of catchy, intricate melodies and a heavy, driving, infectiously-offbeat riffing framework hit me right in the heart of my soft spot for melodic Prog. For those of you new to the music, I must point out Dan’s voice. A self-proclaimed Prog singer and musician, he has spent many years in delving into Death Metal, so you should well be as blown away by his voice as I was upon my first listen. I cannot compare his baritone, low-end belts to any other singer I can think of. For the more metallic of musical minds, I would enthusiastically direct you to similar tracks such as “Forevermore” and “The Maze”, which tend to capitalise on the heavier, more technical arrangements. Excellent, catchy and airy, (though that applies to essentially the entire album) melodic AOR tracks such as “Lucifer’s Lament” and “Chasing the Storm Away” may well be your poison, where vocals, keyboards and lead guitar work together in perfect harmony, whilst still retaining an unmistakable Progressive flair. The track also contains a couple of ballads; the latter, a much heavier diversion of a power ballad. “Divided I Fall” and “27 (Curse or Coincidence?” are phenomenal, exploring a darker facet to the album, dealing with thought-provoking emotions, and what a splendid musical piece of engineering they ride on. To be frank, there is not a single weak track on the album, and it felt like a journey from start to finish; an eventful, colourful and enigmatic one. It is one thing to create excellent songs; it is another to connect them in the same pipeline to create an excellent album; that’s just what “Retribution” is.